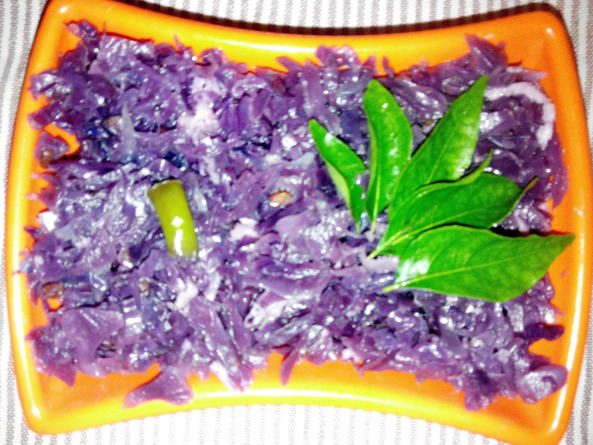 Purple Cabbage Poriyal, many of us might have not used this cabbage for cooking. Moreover, we will not get this vegetable easily in all vegetable shops. I tried this dish once and liked it very much. Now, I get this cabbage whenever I see it in the market. So, you too grab one next time when you see this in market and try this dish. 1. Purple Cabbage - 1 No. 2. Green Chili - 1 No. 5. Grated coconut - 2 Tbsp. 1. Chop the cabbage, onion and green chili and keep aside. 2. Heat oil in a pan and add the mustard seed. 3. When they stop spluttering add the urad dal and saute till you get the aroma of urad dal and the color changes to light brown. 4. Add the chopped onion, green chili and curry leaves and saute it until the onion turn translucent. 5. Add the chopped purple cabbage and salt and mix well. 6. Keep the pan closed for 2 mins. 7. Open the lid and sprinkle some water and cook on medium flame until the cabbage is cooked. 8. Once the cabbage is cooked, add in the grated coconut and cook till they become dry. 9. Purple Cabbage Poriyal is ready to serve.